Today’s Anatomy of a Photo is about the frustration of failure. Bear with me here as I ramble over, under, and around the point. Hopefully I’ll get there eventually. The other day when I was at the craft store looking for spray adhesive to mount my most recent photo poster I found a set of fifteen glow stick bracelets for one dollar – assorted colors even. I love glow stick bracelets except obviously I never wear them nor do I know anyone that would, and they’re too small for cat collars, so … I bought them anyway. They seem like a good kind of emergency prop, you know? Fast-forward a week or so and we arrive at yesterday. This is the part I can never explain, the part that revolves around the stupid things that happen inside my head without me asking them to. While cooking bratwurst I suddenly had a vision of a regular hot dog with a red glow stick poking through both ends (having been inserted through the dog longways). It was one of those moments I enjoy wherein I find the weird juxtaposition I’m always longing for. When I was a kid I was afraid to cut open a glow stick because whatever was inside was obviously not for eating and would probably kill you in horrible ways instead of turning you into a Teenage Mutant Ninja Turtle or something*. So what better thing to put a glow stick into but something you are supposed to eat? Or the other way around – what better to put into something you’re supposed to eat than a radioactive pink glow stick? This is the other part I can’t explain – why that idea derailed and I never bought the hot dogs. 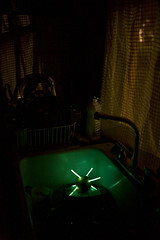 I got fascinated with the idea of an atomic apple instead, using the green glow sticks. Why? I don’t really know. I think it has to do with the fact that glow sticks put off light (duh). To make them obvious and glowy, well, you have to photograph them in dim lighting. A hot dog is a complex beast with multiple toppings, all of which have their own colors, and all of which would be lost in murky light. So … better to go with an apple, a fairly recognizable shape (as long as you turn it so that the stem is in profile). A banana was also briefly considered but I feared it would turn brown around the entrance points while I was shooting, and who wants their fruit puncture wounds made so blatantly obvious? Not me. Not me. With that great green apple in mind I went to the grocery store with an expired glow stick. We shop at a small neighborhood market where we know all the cashiers, which explains why eventually Pinky came up to me and said, “Kevin, what in the world are you doing?” I told her I was looking for the perfect apple for a photography project, and while saying so I bent the glow stick around the apple I had in my hand, pantomiming the awesome forces that were to be unleashed from this humble fruit. She shook her head and walked away. A different cashier completed my transaction. Originally I had planned to use this apple as a test apple but I have a history of trying “test” photographs that end up taking forever and turning into the real thing because I have no patience nor willpower when it comes to waiting until the light is better tomorrow. In this case, well, it kind of ruined my photo. By the time I got home all my natural light was gone daddy gone and I resorted to using lamps, which never ever works for me and you’d think that with a few years’ of experience under my belt I’d have learned by now, but no. I haven’t. I used a disposable chopstick (you keep those in your kitchen, right? They’re insanely handy. Ask them for extras next time you pick up your Chinese carry-out) to push holes in the apple because it (the chopstick) was the same diameter as the glow sticks. I originally wanted the glow sticks curved around the apple kind of like the atomic symbol, you know, an atomic apple, but the sticks were too short and wouldn’t make graceful curves but instead big bunny lump ears. I settled on straight through, then, like some kind of horrid landmine. A little spiky luminescent abomination. I needed a base for this glowapple to sit on, of course, and I couldn’t think of anything interesting. Books? No. Wine bottle? No. Cat? Maybe, but no. Eventually I realized that one thing I rarely use in my photography is ice. Ice! I envisioned this glowing apple atop a hill of ice, shining like some tribute to radioactivity, the prize awarded annually to the grower of the best frankenfruit. Just in case you were ever thinking of piling ice cubes into a mound, well, let me save you the trouble and state the obvious: ice is slippery and does not mound well. So there I was, ice mound slipping into ice flats, the lighting also flat and lifeless since I was trying to use various combinations of lamps. The background was uninspiring and I couldn’t get the apple piled high enough to get it out of view of the baking tray I was using to collect the water from melting ice. I couldn’t make a far off telephoto shot work, and I couldn’t make a close-up wide-angle shot work, and oh did you know that cold will slow down the reaction inside a glow stick and make it last longer? This is cool if you need to keep one overnight, but in my situation the ends of the glow sticks that were resting on the ice were hardly glowing, while the other ends (in the air) were blazing away, so it just looked cheap and unbalanced. Finally I got frustrated with the whole damn thing and just threw the pan, ice, glowapple and all into the kitchen sink and went to clean up the front room and put the lamps back in place. I reviewed one of my test shots on the computer and it was just as miserable as I feared. All this “work” lost put me in a foul mood – not to mention I had used the only three green glow sticks from the assortment pack, which meant I couldn’t do the apple shot again even if I figured out how to make it look good. I spent some time reading, some time goofing off on the computer, and by then I’d forgotten all about my miserable failure. I went into the kitchen to put my water glass in the sink and there it was. There was something pleasant about the glowapple sitting in the sink in the dark, with the light from the street coming in. We’ve all gone to the kitchen in the middle of the night and seen the dishes in the sink. It’s the very picture of American domesticity. Okay, maybe you are perfect and wash your dishes every night, but some of us occasionally let it slide. Anyway, the apple set so innocently in the mix seemed to fit perfectly, while at the same time obviously it was something completely out of place. Likewise to me personally the moment seemed perfect – this monument to earlier failure tossed casually aside suddenly became the very thing it wasn’t: an opportunity for a decent photograph. I went and got my camera, ramped up the ISO so that I didn’t have to dig out my tripod, underexposed the shot by two stops so that the room would remain dark and the exposure time would be short enough that I could do it hand-held, and … there you have it. Nothing at all like I originally envisioned, certainly coming across as a hand-held snapshot, but still containing a little bit of something interesting.